Lego evangelists insist that the plural of 'Lego' is 'Lego,' not 'Legos.' Yea, verily, the Book of Lego sayeth: "If thou desire to speaketh of multiple pieces, thou shat utter, 'Mineself haveth many Lego or mineself haveth many Lego blocks.' A pox be upon any man who sayeth, 'Mineself haveth many Legos.' Amen." Not using all upper case letters when writing the word; i.e. LEGO vs. Lego, is a mortal sin to the Lego faithful. I'll tempt Fate here since using all caps online is interpreted as shouting. Seriously, though, Lego has made a fortune selling blocks not just for little kids to scatter on the floor for parents to step barefooted on, but also to adults who use them for amazing works of art and for robotic creations. I have written a few times about Lego projects, or instance the full-scale model of a Rolls Royce Trent 1000 turbine engine, and the many tech-related Lego subjects of renowned Lego sculptors Andrew Lipson and Nathan Sawaya. Now, an online Lego building block simulator allows you to build simple objects without the expense or mess of actual blocks. 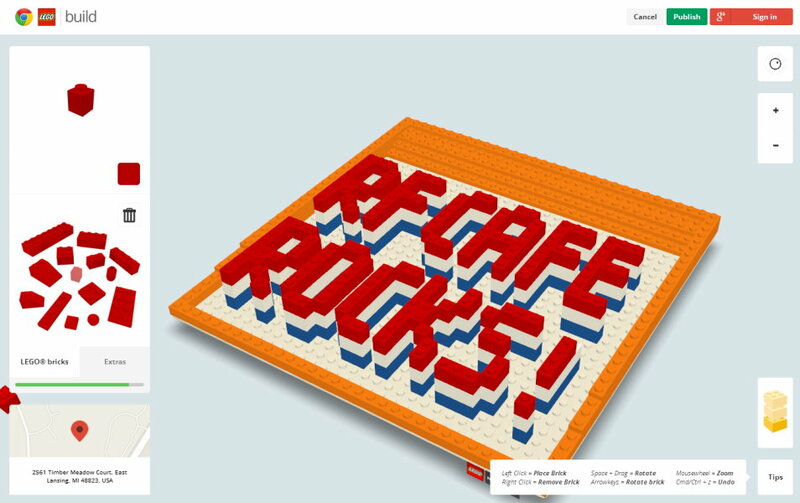 You won't be able to incorporate motors, lights, speakers, sensors, cameras, or microprocessors in this version like you can with a Lego Mindstorms set, but you can throw together some cool 3D structures like my "RF Cafe Rocks!" example (took about 5 minutes to create). Since Legos are universally recognized and loved, maybe you could build a model of one of your current projects and use it for a cover sheet on a report or presentation; it would lighten the mood in the room more so than a corny joke. 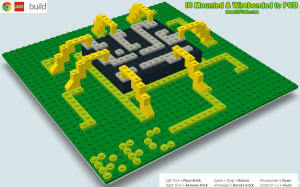 An IC die with metallization patterns on the top and some gold (yellow) bond wires to a substrate would look really slick (see my example above), as would a connectorized amplifier block or an antenna. After you try your hand at it with the simulator, go buy some Lego blocks and build a hard copy. Heck, if you have a 3D printer available, use that. 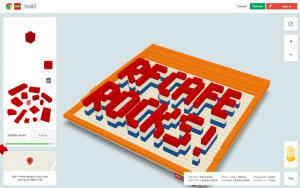 Even if you don't plan to use LEGO BuildWithChrome, at least add the website to your kid's Favorites bar since it is a good tool for developing 3-dimensional perception skills. BTW, it does not work well with anything other than the Chrome browser.